With their elusive first win now under the belt, Embassy Racing still had a mountain to climb if they were to maintain front-running form at Thruxton. The super-quick circuit is one that would suit the Ferraris down to the ground and there were two other new mid-engined rivals making their debuts, in the form of the Eclipse and Cadena Moslers. The first representative time was from the #35 Scuderia Ecosse Ferrari, with a 1:13.394. No one else was remotely close to that time, until the sister car improved fifteen minutes into the session. 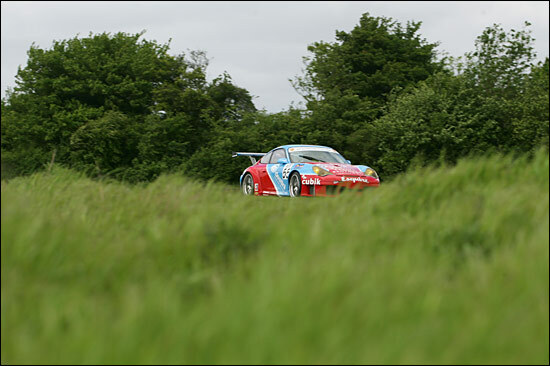 It looked impossible for any of the Porsches, TVRs or Moslers to challenge the Ferraris for outright pace this weekend. Ben Collins returned Embassy to the track and moved them up to up to third quickest, but still a rather worrying two and a half seconds behind the Ferraris. Ben rejoined for the last fifteen minutes and needed to find a full second if he was to move up to third again. The Ferraris could not be beaten over the course of a single flying timed lap this weekend, but with such a strong driver pairing, Embassy had a good chance over the course of an hour long race. They would hope to be starting their challenge from better than sixth though, and this was their last real chance to work out where the extra pace needed to come from. The qualifying sessions are so short at fifteen minutes, and so close together, that there is no chance for the teams to carry out any meaningful set-up changes there: by then the drivers generally have to make the best of what they have got. Collins’ final stint was blighted by traffic however, and ended in a high speed excursion at Church, leading to the team giving him the moniker of “The Lawnmower Man”, at least as long as they were picking grass clippings out of the car anyway. “I heard Jonathan saying something on the radio and then I said ‘I can’t hear you’, the next thing I knew I was flying off the track nearly flat out. I don’t fancy doing that again.” A bemused France had “told him the Monaro had blown its engine at Church and there could have been oil on the track, but he couldn’t hear me, the next thing he said was that he’d gone off at Church!” The Embassy engineers would have to study all the morning’s data and get their heads and spanners together over the course of the next three hours if they were to line themselves up in the best possible position for both races. Neil had only about seven minutes to post his qualifying time, the team opting to bring him in after an exploratory lap and have a good look at the car. Initially, it looked like Embassy were adopting a ‘strategy’ born of 2004’s Thruxton experience, when they started at the back in the Corvette, charged through the field and had their most successful weekend of the year. Clearly, even just for the sake of France’s heart, this wasn’t the case and Neil would have his work cut out. Fifteen minutes isn’t long to qualify, seven minutes is desperately short. An improvement of 2/10ths would have seen him second, but alas it was not to be. Thompson made a late improvement to go second so Neil would start Saturday’s race from fifth, behind Ferrari, TVR, Mosler and TVR. Behind him he would have Niarchos (Ferrari), Keen (Mosler) and then the two Eurotech Porsches, inexplicably off the pace at this round. 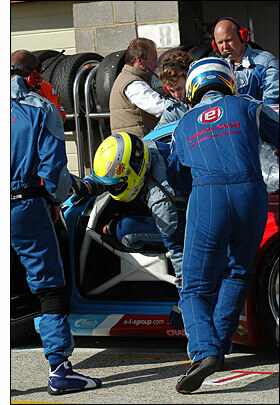 Ben Collins would also start from fifth spot on the grid on Sunday. Unlike Neil, he had the benefit of the full fifteen minutes to work on his time. Ben’s first flying lap of 1:15.457 was a bright start, and initially placed him second, just down on Hughes’ TVR, but then Kane squeezed Embassy back to third. Where were the Ferraris? Kirkaldy was in the pits until the last five minutes, but that is all he needed to gain pole with a soul-destroying 1:12.296, more than a second ahead of anyone else. The front row was to be all-Ferrari yet again, Mullen eventually bringing his car from way down in tenth. The hype of a bank-holiday weekend heatwave proved to be just that, and the day was actually rather cold for late-May, with a very strong breeze blowing a mixture of dark and light clouds over the circuit. It looked like it could do absolutely anything over the course of the day, but mercifully it stayed dry. The reliability of the new Moslers was something of a question mark, as was how well they would last on their tyres around this harsh surface. The other rivals, TVR, also had doubts over tyre longevity. “I doubt they will last the race on one set of tyres, but we should be able to run straight through,” said Jonathan France. The Ferraris certainly threatened to make it ‘boring’ if they were indeed to race away, but even then there would be plenty of interest in the scrap and tactics between everyone else, particularly if Eurotech could find the pace they needed to get back into the mixture. The chance of a Ferrari whitewash ended as early as the green flag lap, when Niarchos’ car could not get moving. A driveshaft failure sidelined the car, but also caused a delay to the start of the race, as there were still marshals on the track when the field bundled back through the chicane. .....“but then I got tangled with one of the TVRs and ended up with a puncture.” Some would say it was race over at this point, with only two laps gone, but at least this gave the charging galacticos nearly a full hour to get back on terms. Neil had work to do. “I thought we were back to last year,” said an exasperated J. France. 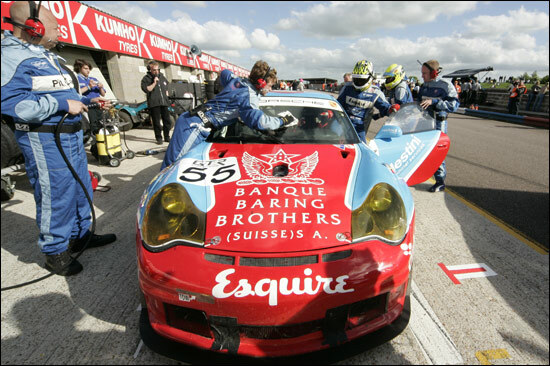 Having changed the punctured tyre, Cunningham lapped quicker than the leader on many occasions, scything his way through traffic to be 19th by the end of lap five and 17th by the next lap, but had a huge slab of eight GT3 cars to dismiss before he would be up to the lowliest GT2 cars – the McKever / Jones battle for seventh. A spin for the leader, which could have flat-spotted his tyres, was some encouragement, as two TVRs took over leadership of the race. With ten minutes gone, Cunningham was the fastest man on the circuit, picking off at least a car a lap, whilst the lead group battled hard and tripped over each other to some extent. 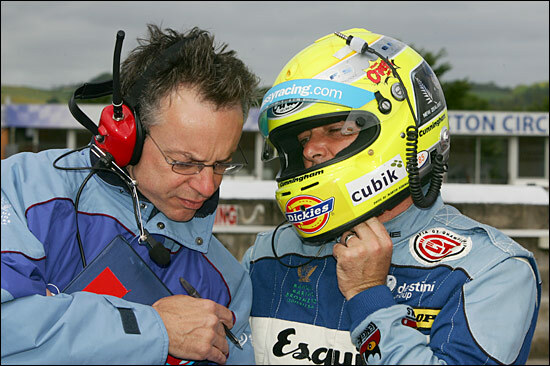 By now Eclipse was having a dream debut, with the TVRs lacking in front-end grip into the chicane, Phil Keen eagerly seized the opportunity to take the lead. 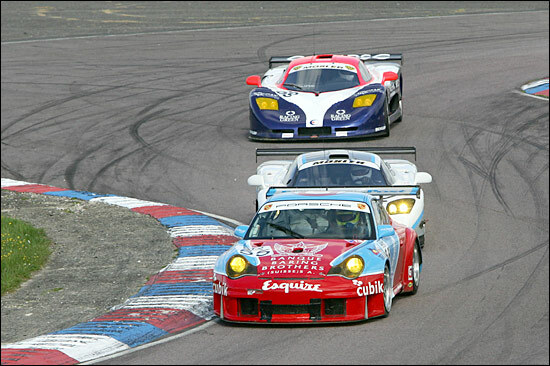 “Suddenly the race seemed to come right back to us,” was Jonathan France’s explanation of the following events: Kershaw’s Mosler had gone missing, McKever’s attempts to pass David Jones were getting increasingly desperate, Kinch was lapping down into the 1:22s, the safety car was standing by - and Neil Cunningham had passed all of the GT3 cars and was eighth overall, back in the points. Ben Collins’ prediction of a boring race was proving to be far from the truth. With 18 minutes gone, Neil Cunningham was past McKever into the chicane and past the Jones RSR over the line into a stunning sixth. Then the safety car came out to allow recovery of the Cadena Mosler – so nearly all the harm of the early pitstop had been undone already. The order for the restart was Keen, Pearce, Thompson, Kinch, Jordan, Cunningham, Jones, McKever. A liberal sprinkling of GT3 backmarkers lay between most of these cars, but Mike Jordan did not have that luxury, he had the bold blue and red face of the Embassy Porsche looming very large in his mirrors. With the safety car still on track as the driver-change window opened, the pits became very busy, but Embassy could not get the message across to Neil Cunningham. “The extinguisher had gone off just before the start and every time I tried to use the radio, bubbles just came out of it. I couldn’t hear anything from the crew either, so by the time I saw the board telling me to pit, I couldn’t have swung in, otherwise I’d have been in the wall,” said a disappointed Neil after the race. The extra lap proved to be the undoing of Embassy’s race, the sight of the Cadena car coming past under its own power could mean only one thing – the safety car wasn’t needed any more. 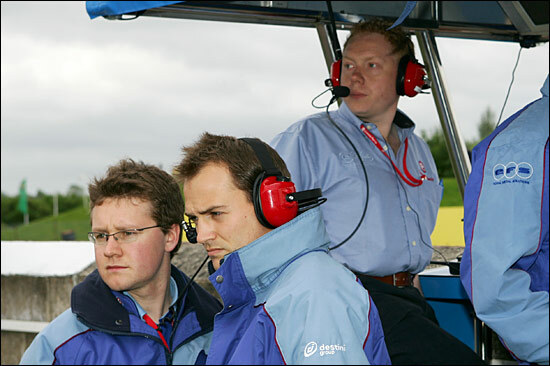 Neil, now leading, had to follow the safety car back into the pits and the freshly-installed Ben Collins must have been banging his steering wheel as Hughes, Kirkaldy, Hyde, Bentwood, Kane, Caine and Godfrey Jones streamed through, some 40 seconds before the Embassy Porsche re-joined in 13th. “It was absolutely galling,” for the team boss. It wasn’t the two places lost in class that were galling however, it was the minute or so on track that had slipped away, and with only twenty five minutes left, Collins would have to really charge to be able to move up. A great scrap at the front developed, but Hughes was obviously holding Kirkaldy up and inevitably, he succumbed to Ferrari pressure. Michael Caine suffered a broken driveshaft out on the circuit, so Embassy moved up to seventh in class, tenth overall. Collins now could only hope to catch the Jones / Marcos / Morgan scrap for position, but that was some 15 seconds further up the track and of that trio, only Jones was in GT2. Ben Collins easily had the pace to get himself ahead of Jones by the end of the race, provided the Morgan and Marcos did not cause him too much of a delay. The Marcos in fact caused no delay at all, having retired, and a puncture for Tech 9 meant that by the time Collins breezed past the Morgan, he had jumped to seventh overall and was right on Jones’ tail. Jones succumbed, as was always inevitable given how easily Collins had reeled him in, so Embassy were now sixth. It looked like that was as good as it was going to get, with Hyde’s Mosler some 14 seconds ahead and less than ten minutes of the race to go. Hyde was struggling though, and Collins was able to salvage a very creditable fifth place for Embassy Racing with just minutes remaining.